Dr. Seda Ibrahimi, presented at Summer Academy 2017 about disordered eating in children and adolescents. This presentation is an overview of signs and symptoms as well as current treatment modalities. Increased their knowledge of latest evidence about incidence, treatment of, and prognosis for disordered eating in youth. Increased confidence in identifying, supporting, and referring students with disordered eating. Seda Ebrahimi, Ph.D. is the Founder and Director of the Cambridge Eating Disorder Center (CEDC). CEDC is a nationally renowned specialty center providing a full continuum of care to individuals who struggle with eating disorders. Dr. Ebrahimi has been in the field of eating disorders since 1986, beginning as a pre-doctoral intern at Brown University’s internship consortium. She continued with clinical and postdoctoral fellowships and an assistant clinical professor position at Brown University and was then named a Director of the Eating Disorders Research Program at Butler Hospital. 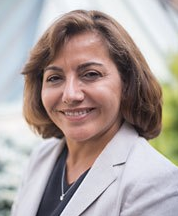 Dr. Ebrahimi was the Director of the Eating Disorders Treatment Program at McLean Hospital from 1993-1998 and has been an Instructor of Psychiatry at Harvard University since 1993. Dr. Ebrahimi is a member of Academy for Eating Disorders, International Association of Eating Disorder Professionals and American Psychological Association. She continues to lecture and provide presentations at conferences and academic institutions. Dr. Ebrahimi has also been involved in patient advocacy at the local and national level. In accordance with Northeastern University School of Nursing, the School Health Academy requires that presenters disclose any relationship (e.g., shareholder, recipient of research grant, consultant, or member of an advisory committee) that the presenters may have with commercial companies whose products or services may be mentioned in their presentations. The existence of these relationships is provided for the information of participants and should not be assumed to have an adverse impact on faculty presentations.